TUSKEGEE, Ala. — What in the world is a W.E.B. Du Bois scholar doing sitting atop the university that Booker T. Washington helped to create? It’s a question that Dr. Brian L. Johnson has been hearing since he took the helm of Tuskegee University last June as the school’s seventh president. Johnson, who has authored and edited seven books, including two on Du Bois, has great admiration for these two towering Black intellectuals who — despite their public feuds about the best techniques for improving the plight of Blacks in the years after slavery — managed to find time to sometimes collaborate, even as they worked to secure their individual legacies in the annals of American history. To some, Johnson may have appeared the unconventional choice to become president of the private, historically Black university founded in 1881 after Reconstruction. An expert in 17th to 19th century American literature, he did not have the academic expertise in the STEM fields, which has traditionally set Tuskegee apart from other HBCUs. And unlike many of his predecessors, he was just 40 years old when he was unanimously tapped by the school’s Board of Trustees to lead the rural Alabama institution. “You hear people say, ‘I’ve been in higher education for 30 years,’ but it could be that you’ve had the same experience 30 times,” says Johnson, who scoffs at the idea that he’s too young to preside over a $147 million annual operation with an endowment of about $118 million. “I have diversity in my portfolio. I’ve done a budget module; I’ve been a liaison for accreditation. I’ve handled fiscal budgets,” he says, as he points to the five pillars of his administration: strategic priorities, first-year goals, revenue-generating and budget-impact decisions, new university-wide initiatives, as well as plans to launch a capital campaign in the near future. It’s a job that Johnson, who was raised by a single mother in the tough inner city of Durham, North Carolina, in the 1980s, says he’s been looking to assume since his days as an undergraduate at Johnson C. Smith University. After earning a master’s degree in English from the University of Wisconsin–Madison, Johnson headed to the University of South Carolina, where he was the first African-American male in the school’s history to be awarded a Ph.D. in American literature in 2003. One of his first jobs after receiving his master’s was coordinating the Ronald McNair program on campus. “I’ve always held both roles simultaneously,” he says of his career, in which he’s held appointments as both a teacher and administrator at Gordon College, Claflin University and Johnson C. Smith University. Ambitious, he secured several coveted fellowships, including one sponsored by the American Council on Education that took him to the Lilly Family School of Philanthropy at Indiana University-Purdue University Indianapolis. Prior to his arrival at Tuskegee, Johnson was the interim vice president for strategic planning and institutional effectiveness and assistant provost/assistant vice president for academic affairs at Austin Peay State University in Clarksville, Tennessee. But much of Johnson’s preparation about how the presidency works has come from his one-on-one interaction with veteran college administrators who have served as mentors, such as Dr. Dorothy Cowser Yancy, the former president of Johnson C. Smith and Shaw universities who urged Johnson to “learn about the money and the mechanics” of running an academic institution early on in his career. At Tuskegee, Johnson’s arrival has been met with enthusiasm from some students who are excited by his vision and the access that they have to him. Renfroe lauds some of Johnson’s early decisions, such as his willingness to extend the hours at the student center and to establish a one-stop shop that allows representatives from financial aid, student accounts and the registrar’s office to handle student queries in one centralized space. He dines with students in the cafeteria, participates in a weekly fireside chat and engages with students via social media. 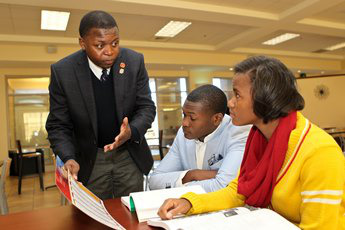 While these efforts might be viewed as small steps, many HBCUs — Tuskegee included — have been routinely criticized by alumni over the years for not running an efficient operation. His long-term plans include increasing enrollment from around 3,100 to about 10,000 students, renovating old buildings on campus and increasing alumni giving. In an effort to encourage others to give, he pledged a $100,000 donation over a five-year period to the university. Johnson is also keenly aware that he has to communicate to various Tuskegee constituencies, including older alumni who are steeped in tradition and slow to embrace change. Expanding Washington’s legacy comes inevitably with the expansion of Tuskegee. “I want to reinvigorate that tradition to show what this man practically did,” says Johnson, whose message of transparency and fiscal responsibility has become a mantra for his administration.